The Portugal National team captain and 5 times Ballon d'Or holder Cristiano Ronaldo becomes the most popular and followed person on Instagram with 144m followers, taking over from an American actress and pop star Selena Gomez which clearly shows that he is now one of the most recognizable figures on the planet. In 2014, Cristiano Ronaldo reached 100 million Facebook likes but that figure has grown to 122,654,776 likes, 120,800,613 followers and still counting which made him one of the most popular footballers on earth. His Instagram fan base growth can be attributed to his recent switch from the Spanish side Real Madrid to Italian Seria A giants Juventus on a shocking 100 million deal after a successful 9 seasons at Real Madrid. The impact of Ronaldo in recent Real Madrid success was clear for anyone to notice that something big is missing in current Real Madrid team immediately he left the Europian champions (Real Madrid) and presently he scored 7 goals and 4 assist in 10 games for the Italian side Juventus while his formal club still in doubt to make any difference this season after 3 consecutive losses to Alaves, Levante and Barcelona seeing them in 9th position in the table and 7 points behind Barcelona. Cristiano Ronaldo didn't say much as he becomes the Instagram most followed person in the world instead he expressed his feelings and happiness in relatively modest circumstances, with an image of him in the gym. 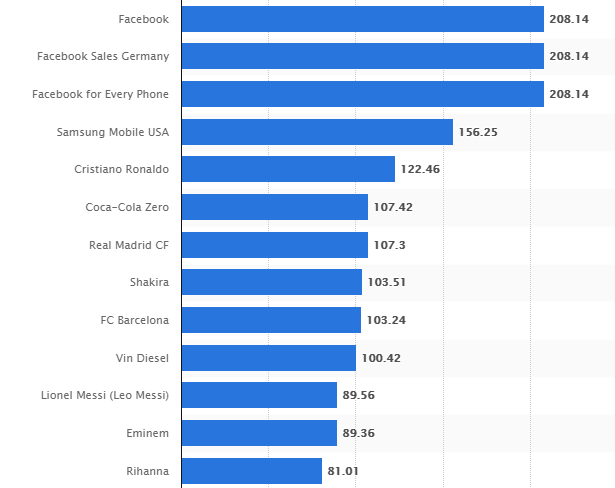 Cristiano Ronaldo is also the second most liked Facebook page behind Samsung Mobile USA page when you remove official Facebook fan pages and such height is hard to attain. This will surely be an interesting news to all CR7 fans as they always wished the best for their man, seeing him always on top gives them much Joy they need. Cristiano Ronaldo deserves all the fame, wealth and respect. He showcased the world that it doesn't matter where you come from. It is the hard-work and determination that defines you as a player. I hope that he will help the Old Lady win the UEFA Champions League they crave.